Lindsey Wilson College today announced that they will partner with AeroCat Bicycles to be the official team bike supplier for the 2008 road season and beyond. Lindsey Wilson Cycling and its rich tradition of cycling excellence will rely on the advanced technology of Aerocat's carbon monocoque frame and forks to provide them with the lightest, fastest, and best handling bikes in all of Division 1 collegiate racing. "We are so excited to be working with such an incredible sponsor like AeroCat," noted Lindsey Wilson coach David Grigsby. "When it came to putting our best athletes on the best equipment, there was quite simply nobody else we wanted to work with more than Dave Poole and AeroCat. They were our first and only choice." There are a lot of details to cover when coaching a cycling team. Knowing your equipment is going to hold up to the rigors of training and racing at the highest level gives us peace of mind and allows us to focus on other variables. AeroCat will be an integral part of our success in the seasons to come. Grigsbys' passion for coaching and the Lindsey Wilson program is equaled only by the energy of Dave Poole and the AeroCat family. "We are searching to form long-term sustainable partnerships with teams and programs that have the full package. This includes strong leadership, integrity, passion, and athletic talent. There's a lot of good talent out there in the sport of cycling. AeroCat is looking for athletes that can bring all of those elements to the table. Grigsby has a vision for the Lindsey Wilson cycling program and we are honored to be part of it," said Poole. AeroCat, LLC is based in Portland, Indiana, USA and is a manufacturer of high performance bicycle products. The company specializes in carbon fiber road and triathlon bicycles and is planning to expand into the mountain bike cross country market for the 2009 season. For more information visit the company's website at www.aerocatbike.com or contact Dave Poole at 260-703-8001 or dave.poole@aerocatbike.com or Charity Leist at 765-760-8062 or charity.leist@aerocatbike.com. 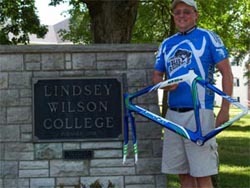 Lindsey Wilson is one of the premier Division 1 cycling programs in the nation. Home to both National and World Champions, Lindsey Wilson competes in multiple disciplines including road, mountain, cyclocross, downhill and dual slalom. Dedicated athletes of all abilities who are interested in exploring scholarship opportunities in cycling can call Coach David Grigsby directly at 270-384-8173 or check out the website at www.lindseyathletics.com.